Buy with confidence! Our Recon items include all necessary parts and are guaranteed to function like New, backed by our 120 Day money back guarantee. Please note however that Recon units received from the manufacturer may or may not include accessories shown with this listing.Important Notice: Lithium-Ion Item - Express Delivery option not available due to transportation regulations. Milwaukee's FUEL Series line of tools deliver unprecedented power and performance at an outstanding value. Featuring Milwaukee's unique POWERSTATE Brushless Motor technology and REDLINK tool intelligence system, the FUEL runs harder and longer than competing tools on the market to provide a long lasting tool built to power through tasks with minimal maintenance. It's hard to believe these things are refurbished. I love my Milwaukee m12 fuel they have more than enough power for my needs and are like brand new. CPO customer service is the best. Sweet tools, certainly competitive w/the Japanese manufactures. The only negative, and it’s minor, is the carrying case has inadequate storage for accessories. I am a diehard Ryobi one+ fan. My son and law needed some tools, so I gave him my set and chose these as refurbished. I tried out the M12 Fuels at HD and looked at the refurb prices at CPO. I have purchased other refurb tools from CPO so I had no reservations. THESE TOOLS ARE INDISTINGUISHABLE from new! They are powerful! I saved over $70 on these. Nice hard case, two batteries a 4.0 and 2.0 amp hour battery. This simply can't be beat. They have more power then the Ryobi. Thanks CPO! Shipped to my house in two business days. I highly recommend CPO to my friends. The 12 volt tools have great power, are light weight , makes working with them for extended periods easy on the arms. I’ve bought several recon tools and all have more than paid for themselves! I recommend to my coworkers and friends and family. They make great gifts. I liked these tools, but as an m18 owner I was looking for smaller tools to carry around for smaller jobs. These tools are only slightly smaller than my m18 equivalents. I ended up returning this and buying the newer models. They are lighter and significantly shorter but a little wider. If I didn’t already have the m18 tools these would be fine, I just didn’t find the tools themselves to be much smaller... the battery is significantly smaller! Don’t be worried about 12v Milwaukee tools. I have been using my new impact driver and hammer drill almost entirely instead of my m18 tools. Looks like new, feels like new, half the price and warranty. Second one I bought. Fast, easy, and drills worked great! I ordered on a Thursday and received my drills on Mo day. Price was great, service was fast, drills are great condition! I have always been a Dewalt man but the last few tools purchased from them have been so cheaply made they just did not last. We made the switch to Milwaukee and this M12 Fuel combo from CPO is the best deal we could find. 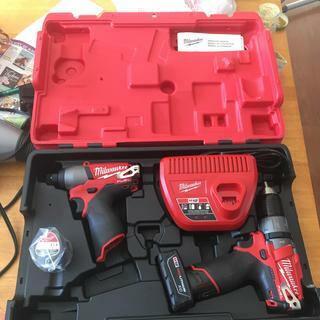 Same exact kit at home depot is over $100 more right now...great deal and the tools when they arrive literally look brand new, I could not find a defect on them at all and the guys I work with couldn't believe the price. I will be purchasing more from CPO and always reconditioned from now on. Do they come with belt clips? BEST ANSWER: The batteries are tested to have 95% of their life,anything below the 95% then new batteries are added to the kit. Is this the most recent generation? How can you tell the difference? BEST ANSWER: This model is a Generation 2. The model numbers on the drills will determine the generation of the kit. You can also contact Milwaukee directly at 1-800-729-3878. The agent will be able to provide you with more information about the different generations. BEST ANSWER: We have all the information listed in the includes section, showing the model number for the batteries that are included with the kit. we will request to have the picture updated on our website. I apologize for any inconvenience this may have caused.